On 29 October 2018, Turkish President Recep Tayyip Erdoğan opened the new Istanbul Airport with a magnificent ceremony. After just 42 months of construction time, the airport which is destined to be the biggest airport in the world, became operational. On 3 March 2019, the airport will become fully operational, replacing the current Istanbul Atatürk Airport, which will be closed for scheduled passenger flights. “We are all ready for the occasion,” stresses Kadri Samsunlu, Chief Executive Officer of IGA Airport Operations. “As a major hub at the intersection of Asia, Europe and the Middle East, we will bring the world closer together,” Samsunlu pointed out. “With an initial capacity to serve 90 million people which will be expanded to 200 million once all phases are completed, Istanbul Airport will be the biggest airport in the world.” Atlanta Airport is currently the busiest airport serving the highest number of passengers with 104 million passengers per year. Istanbul Airport also overrides its competitors with its size. The airport is 3.5 times as big as Beijing Airport, which has an area of 23 million square meters. “Our challenge is to be the biggest and the best,” Samsunlu said. The second phase of Duty-Free Zone, laid out on an area of 53,000 m² at Istanbul Airport, was opened on January 15, 2019. Undertaking the operation of all Duty-Free zones at the airport for 25 years, Unifree Dutyfree gathered over 1,000 domestic and international luxury brands under one roof and realized one of Turkey's and the world's biggest travel retail zones at Istanbul Airport. 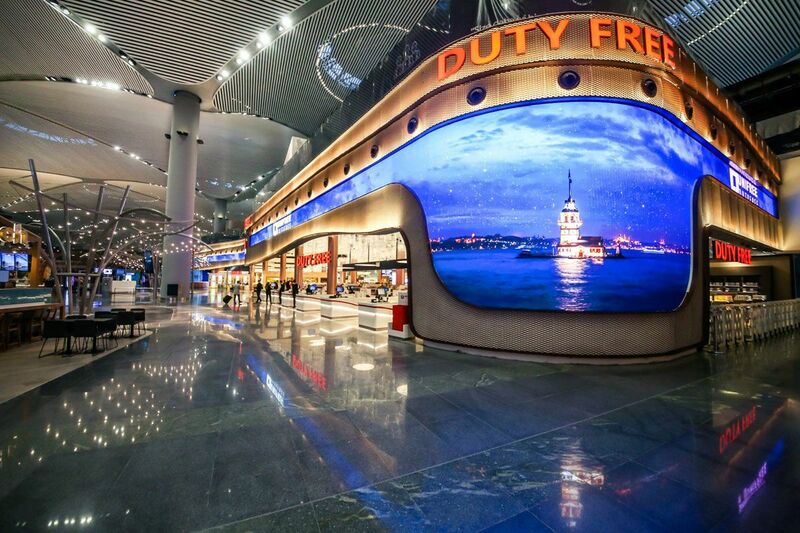 Unifree Dutyfree İşletmeciliği Anonim Şirketi commissioned the second phase of Duty Free shops at Istanbul Airport with its 35 years of travel retail experience in Turkey and its partner Gebr. Heinemann's 135 years of international experience. After the first shop was opened by Mr. President Recep Tayyip Erdoğan on October 29, 5 new shops laid over an area of 8,000 m² are now commissioned, encompassing one of the biggest commercial quarters in the world. The Duty Free zone offers 100,000 m² rental area and duty free is laid out over an area of 53,000 m² at the airport. Majority of the stores under the responsibility of Unifree Dutyfree is operated by Unifree Dutyfree İşletmeciliği A.Ş., while the rest is operated by sub-establishments to which the space is rented. One of the 2 flagship stores with the largest area in the Duty-Free zone, consisting of different concept stores ranging from 4,200 m² to 28 m², was commissioned on January 15, 2019 within the scope of Phase 2. These stores where everyone can find a part of themselves take the visitors' breath away with their wide range of products for all passengers, products specially made for Istanbul Airport and their architecture. The design of Duty Free zone was inspired by the Bosphorus. The zone has 7 different sections, with the size of 9 football field side by side, consisting of the "Fashion Garden", "Family Palace", "High&Lux Hills: Fashion", "High&Lux Hills: Jewelry and Watch", "High&Lux Hills: Fashion and Accessories", "Style Beach" and "Icon Gulf”. Each section welcomes passengers with concept-related selective domestic and international brands offering rich variety of products. The domestic and national brands have a significant place in this project. Right after the international passport control, passengers will meet Bottega Veneta, Bulgari, Celine, Christian Dior, Emporio Armani, Fendi, Ferragamo, Gucci, Hermes, Loro Piana, Louis Vuitton, Prada and Saint Laurent Paris, brands that signify luxury across the globe. In addition, Turkey's pride brands D&R, Desa, Vakko, Mavi, Atasay, Zen Pırlanta, Yargıcı, Saat&Saat, Rue, Damat&Tween, D’s Damat, Luzdemia, Tamer Tanca and TNC Butik, Emnana, Guard Leather, İpekyol, Machka, US Polo, Pierre Cardin, Cacharel, Dogo, Lambend, Brandy’s and Penti will take their places in this giant project. Through the pre-order system that is to be commissioned soon, the orders passengers make online prior to their travels will await them at the store in Istanbul Airport. In addition, tablets to be put in certain lounge areas will enable passengers to make orders over the pre-order system and connect to their personal VIP sales representatives. The interactive area to be provided within the store through digital applications where passengers can try on makeup and cosmetic products both physically and via AR (Augmented Reality), a special selfie point where they can take pictures at a studio quality and aesthetics and share the photograph on social media, and mirror screens will differentiate the shopping experience at the airport. World's largest Bazaar store, located on an area of 3,000 m² and carrying products from over 100 domestic and national producers, will now be at Istanbul Airport. Bazaar areas, which will be operated by ATU Duty Free, will be the place where local products meet the world with the sale of 1 truck full of Turkish delights and 365 tons of baklava, amounting up to 60% of Turkey's annual baklava export.